There were a lot of movie and TV adaptations of The Three Musketeers in the 20th century, but three of them tower above all the others: the Fairbanks film from 1921, Richard Lester’s 1973 version, and, falling almost exactly in between them, MGM’s star-studded entry from 1948. This is an interesting adaptation: it starts out as a typical Hollywood vehicle for star Gene Kelly, bright, colorful, charming, and light-hearted, a musical without songs, as d’Artagnan (Kelly) finds camaraderie with the musketeers and romance with Constance (June Allyson). But the top-billed actor here is actually Lana Turner, then at the height of her fame, and based on her rôles as a femme fatale in films noir, she’s cast as the wicked Milady de Winter. Now Milady appears mostly in the second half of Dumas’s novel, so to give Turner enough screen time, the movie races through the Affair of the Diamond Studs in its first hour, enabling it to spend its second hour on the schemes of Milady. These schemes take the story into darker places than most screen versions of T3M, and toward the end the tone turns quite grim. The emphasis on Milady also explains the elevation of Athos (Van Heflin), her bitter estranged husband, almost to the level of co-protagonist with d’Artagnan. Heflin, an actor of stature and gravitas, is right up there with Oliver Reed for Best Athos Ever, but Turner doesn’t seem entirely engaged with the part of Milady—though when she’s into it, it works. One thing the aforementioned top versions of T3M all have in common is a recognition that the novel is not only full of adventure, intrigue, and romance, but is also funny as hell. The humor in the MGM version is mainly delivered by Kelly, who puts in a broad and over-the-top performance, adopting some of the exaggerated silent-film mannerisms of Douglas Fairbanks, Sr., and all of his athleticism. Kelly goes Fairbanks one better, because he’s not just an acrobat, he’s a dancer, and his swordplay owes as much to the school of ballet as it does to the academy of arms. Of course, at age thirty-five, Kelly is too old for the part of d’Artagnan, but that’s true for every screen incarnation until Michael York takes the rôle in ’73, and he makes up for it with energy and dexterity. All the fencing in the film is with thin foils rather than proper period rapiers, but the swordplay, Kelly’s especially, is deliberately theatrical rather than realistic, choreographed to the split-second, and very entertaining indeed. Playwright Robert Ardrey’s script is very good, tight and fast-moving without ever feeling rushed, and contains the inspired idea of making Constance the jailer-in-chief when Milady is imprisoned in England, a vast improvement over the weak coincidence that throws them together in the novel. 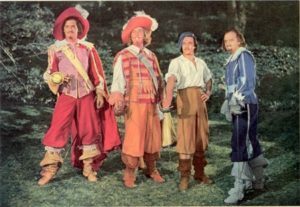 We get some scenes from the book that are rarely filmed; for once all four of the musketeers’ lackeys make an appearance, though only Planchet (Keenan Wynn) gets any lines; and even minor villain the Count de Wardes shows up, mainly so d’Artagnan can impersonate him later. The ending, as alluded to earlier, is dark, but Richelieu’s revenge is forestalled by the famous carte blanche: “It is by my order, and for the good of the State, that the bearer has done what has been done.” Indeed.